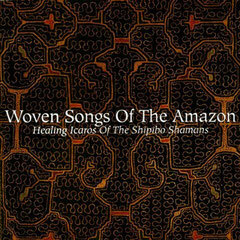 -Woven Songs of the Amazon - ARTE AMAZONIA provides a global voice through art for the indigenous cultures of the Amazon. To weave is to sing and to sing is to heal. And so goes the timeless process that the Shipibo shamans have used to heal their people for countless generations. They do this by using a variety of curing songs, called icaros, along with elaborate woven healing cloths, and the numerous plants and herbal remedies they cultivate in their rainforest enclaves. Every plant, herb, animal, and elemental spirit has its own icaro, which are learned by the shamans in their dreams, as a way of harnessing that spirit’s curing power. This cosmology is explained best in the Shipibo creation myth about their main totem animal, the anaconda. The word icaro is derived from the Quechua verb ikaray, which means “to blow smoke in order to heal”, a reference to the shamanic use of tobacco in their curing ceremonies. The icaro comes to the shaman either in dreams, or from drinking ayahuasca tea, the powerful sacrament that defines Amazonian shamanism. The icaro is heard in the spirit voice of the plant or animal spirit, at the same time as it appears as a geometric pattern in the mind of the shaman. This process, called synesthesia in western terminology, is where the song and its corresponding pattern are literally experienced at the same time, the pattern becoming the inspiration for the woven song cloths. The icaro song patterns are then woven into their garments and healing cloths, in a way that allows them to literally wear their music. The patterns you see within the pages of this CD, are the actual song patterns from these healing songs, a kind of musical tablature, Amazon style. This “capturing of the song” as it were, is how the shamans increase their healing power, simultaneously communing with the jungle biosphere. Woven Songs Of The Amazon is about a day and a night in this rainforest paradise with the extended family of renowned healer and shaman Herlinda Augustine. The album is full of icaros, elder’s songs, children’s songs, and the natural sounds of the Amazon rainforest, from sunrise to sunset. The Shipibo live in approximately 100 villages along the pristine headwaters of the Ucayali River, which eventually becomes the mighty Amazon River. The icaros on this album were recorded in the village of San Francisco de Yarina Cocha, the largest of these Shipibo villages, in a make-shift recording studio that Barrett Martin and Luis Guerra built in an abandoned thatched-roofed hut. “Build it and they will come” they say, and that is exactly what happened. We put the word out to the village singers that two musicians were recording music for a documentary film and if anyone wanted to participate, please come to the abandoned hut down the eastern path, turn right at the giant Lapuna tree, and walk straight on for 300 paces until you see a pile of discarded batteries and a tangle of microphone cables. They came to us, singing as they walked, ranging in age from eight to eighty, some of them shamans, others just giggling children with fascination and wonder in their eyes. The Shipibo generally sing in their native language of Panoan, occasionally peppering their words with Spanish, a result of the Peruvian language programs. Often you will hear the word “shamani” in these icaros, which in Panoan literally means, “to sing.” The word “caya”, meaning “soul”, is a reference to the spiritual nature of these icaros. This is truly phenomenal singing, holy singing, on par with the highest levels of western liturgical music, with a background of rainforest sounds that are equally as hypnotic. The Shipibo shamans can heal with their voices alone, but so can the children with their pristine innocence, and the many voices of the rainforest, birds and insects and thunderstorms alike.